The new Zipit Wireless Messenger is a low-cost portable IM device that connects to 802.11b/g wireless home networks or free hotspots and enables teens to chat away with no service fee. Priced at $99.99, Zipit is way to get kids off the phone and the family PC to talk to their friends in as many conversations as they like. Zipit Wireless Messenger supports the most popular instant messaging services and allows users to enjoy secure, uninterrupted connectivity to online friends. Designed with the help of kids and parents specifically for the young IM market, Zipit Wireless Messenger includes a variety of features to personalize the device, including the My Friendz list to quickly locate online friends and My Emoticonz, which provides easy use of pre-programmed emoticons (symbols, such as a smiley face, frequently used in IM to express an emotion) while typing a message. With a compact, clamshell design, the Zipit Wireless Messenger measures in at 4.25 inches wide by 3.6 inches long and .8 inches deep and only weighs about eight ounces, making it easily portable. 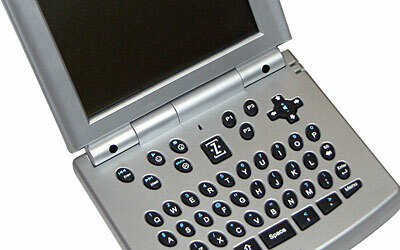 It features a 320x240 LCD screen and a full QWERTY keyboard for fast typing. A rechargeable battery provides four to eight hours of non-stop chatting. Zipit comes in six colors: Inferno Red, Icicle White, Ocean Blue, Pink Ice, Mercury Silver, and Carbon Charcoal. With a focus on security, Zipit gives parents the peace of mind that their kids are chatting with friends without the threat of viruses, SPIM, pop-ups and other unwanted information from unsolicited senders. Zipit has built in encryption and firewall to create a fun and safe chatting experience. In addition to supporting multiple IM protocols simultaneously, Zipit Wireless Messenger supports upgrades for playback of streaming music and customized fonts, sounds, and emoticons. The clamshell Wi-Fi device was developed by Aeronix.